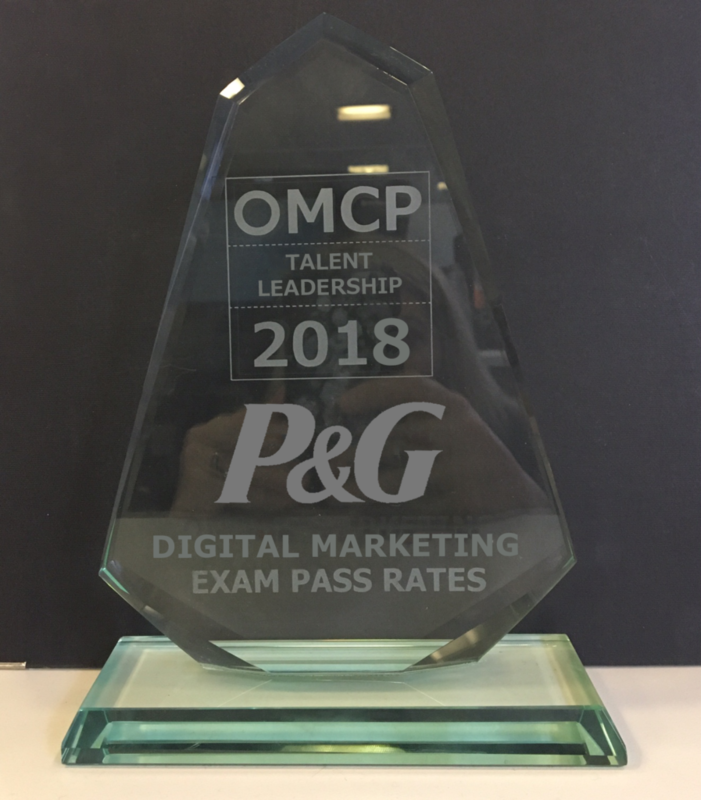 The OMCP 2018 Talent leadership Award for Digital Marketing Certification Pass Rates goes to Procter & Gamble. Procter & Gamble, a leading consumer goods corporation, set out to continue to learn and win in the digital and e-commerce space and to be an industry-leading IT organization. To help deliver these goals, the organization executed a training and certification program based on industry standards set by OMCP. 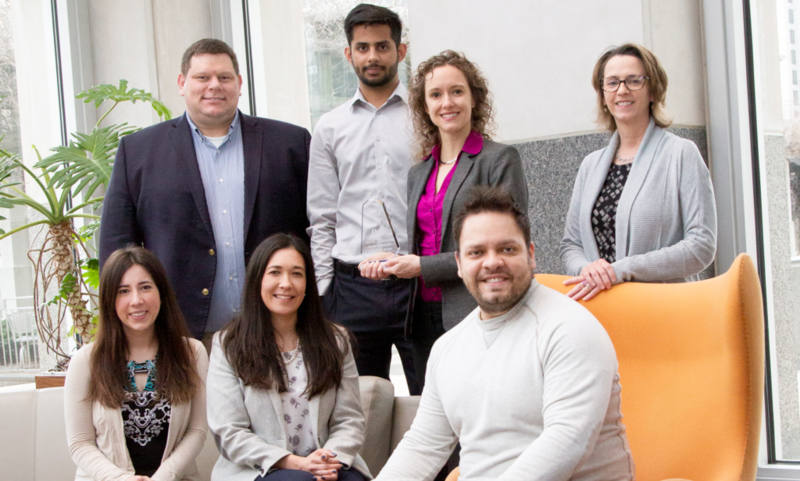 With strong support from senior leaders, Katy Moeggenberg and Carrie Rathod unified brand, IT, marketing technology and other groups to achieve a company-wide 94% certification rate. 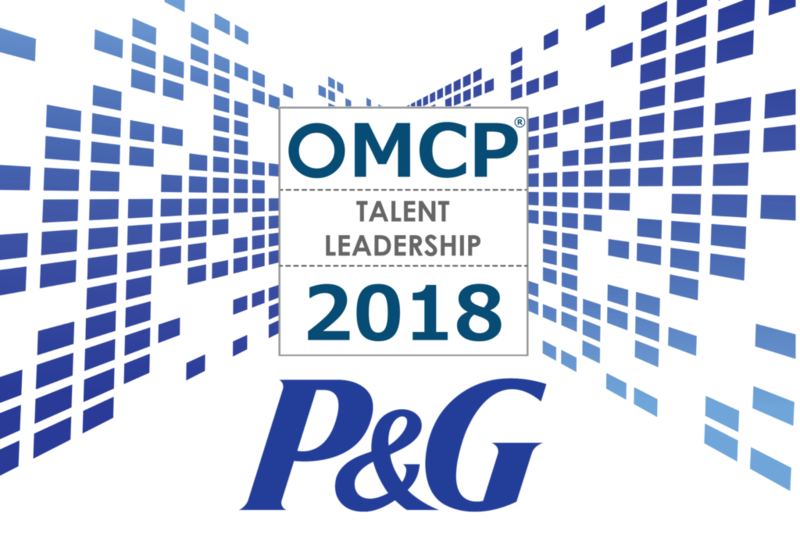 OMCP’s Michael Stebbins interviewed Katy Moeggenberg, Global Marketing Technologist Leader at P&G, to learn how the program achieved its success. OMCP: Katy, would you describe your role in and across the organization? 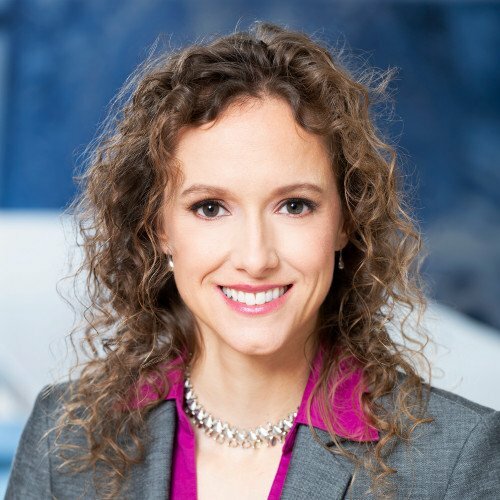 Katy: I am the global leader of our digital technologist organization at P&G. We are an IT organization that sits on the seam of information technology and marketing and I am responsible for career planning, talent management, and training and capability for our team. Each of the employees in this organization sits in a business unit where they report into a leader within that specific business. In my role, I have this unique opportunity to look across the wider spectrum at Procter & Gamble and see our common needs across our business units like Baby, Hair, or Fabric Care and holistically bring that together in a global view. OMCP: Can you describe your support team, the key members who helped you get this implemented and approved? Katy: My key counterparts in this effort were within our brand or marketing function. 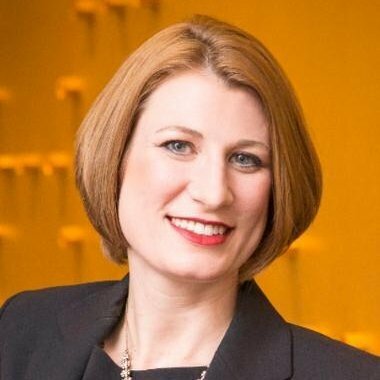 Carrie Rathod, Global Digital Marketing Capability leader, is driving within marketing what I’m doing in IT. I worked with her to prioritize this program across P&G and ensure that IT and marketing are working this together. Brand Manager Carrie Rathod led the program on the marketing side. From an administrative side, I have a few folks that helped with logistics. OMCP: What was the scenario and motivation for this program? Katy: P&G and its leadership have been actively working to advance in the digital space because we know that this is where the consumer is; where she’s consuming media, where she’s buying product. We want to continue to elevate our overall digital IQ across the company. Senior leaders have encouraged us to make P&G IT an industry-leading IT organization. One of the ways they have been driving us is through industry certifications and making sure we have best-in-class employees who are given the right training and opportunities to grow our knowledge. We looked at what was most relevant for our space based on the marketing technology roles and responsibilities. When we did industry scanning with our internal brand builders, we found that OMCA and the organization at OMCP had the industry-leading guidance on how we should be certified in this space. OMCP: What did the program look like? What was it that you needed to do internally and achieve? Katy: Our marketing technology organization has a central training and capability program and we are always looking to offer the right training so the marketing technologists can deliver against the business need, as well as continue to grow in their careers. The effort to become OMCA certified was part of that broader program. Giving them the vouchers for exams so they could easily take them. OMCP: P&G is being recognized for the highest certification pass rate that we’ve ever seen for an in-house team. Can you walk us through some of the things that might have been unique about your program? Katy: The centralized training and distribution of exam vouchers helped. We also had significant leadership support from the highest levels of the IT organization. When my marketing technologists knew they had support from the IT officer, they felt incredibly motivated to make this happen. Finally we really wanted to push that all marketing technologists across the globe were certified by June 2019. It became our organization’s rallying cry that we we’re going to be an industry-leading top-rated organization. Having that spirit of, “Our company officer is supporting it, we’re going to take this initiative as a community,” everybody felt empowered to study. Everybody really wanted to pass. It became our organization’s rallying cry that we were going to be an industry-leading top-rated organization. Everyone felt so empowered through all that excitement. We leveraged training programs designed for OMCP to ensure we would be successful. OMCP: Some of your managers referred to the program as “infectious” and that not only your team but some of the brand managers jumped in. We also learned that the training came from not just one provider. Is that correct? Katy: Correct. We vetted and partnered two providers that had programs designed for the OMCA curriculum: Simplilearn’s OMCA preparatory course, and LinkedIn’s OMCA Course. As people started to hear about our organization passing industry certification exams, more people got excited. And even though I’m in the IT organization leading the marketing technologists, I am closely linked with my counterparts and our brand function who were actively looking at this program. Between brand and IT, we have the same goals as a total Procter & Gamble family. From an IT standpoint, we always want to be enabling the business and focused on the priorities of the business. Therefore it was a natural synergy between IT and marketing to have our organizations going after the certification at the same time. OMCP: How did you notify people about the program? And then how did you distribute entitlement or access to the training and the vouchers for the exams? Katy: We used our marketing technology email distribution list as our communication channel. We created a standard document that shared the instructions, and I also regularly shared progress via email. OMCP: Can you describe the logistics of how you distributed access to training and or vouchers for the exams? Did you make the employee pay for them, or need a certain merit level, or was it just distributed? Katy: For the training and certification exam, they all went to everyone within the marketing technology organization. Anyone in that organization was given a voucher access to it. Since the funding was managed centrally, the marketing technologists did not have to pay directly. OMCP: How did you eliminate waste? You pre-purchased some of the entitlement and access. How was that done? Katy: I was intentional about the number of licenses and exam vouchers that we purchased. I went to my sister organizations in IT and marketing and said, “I have vouchers available for this. If you’re working in the digital marketing and e-commerce space or you have an aspiration to come to a role like this in the future, this would be great proactive training and certification to complete.” I still have people come and ask me for them. The vouchers were in demand. OMCP: What are specific events or stories that you can share that are memorable from the process? Katy: I had started to share with my marketing technologists that we wanted to go after this industry certification. Early on, some of my folks they were getting excited about it and saying, “Okay. This sounds good,” but I’m sure that there were still some questions and just a little bit uncertainty about this new process. But when our CIO used us as an example to stand up in front of the entire global IT organization and said, “These marketing technologists are going after the effort to be industry certified.” and applauded us for that, I think that was the moment when we were all really proud of the efforts that we were doing. OMCP: What were some of the challenges you ran into? This is, by far, the highest certification rate we’ve seen from any in-house organization to date. Fitting Training into a Full Work Load. We had to get creative about finding ways to work in training materials because no one had available capacity to add this to their daily work. It took us a little while to get folks to prioritize it, but once I had a few early adopters, we celebrated and highlighted them to the organization. For example, early on, we pointed out when all of a single business unit had passed the exam. That helped give some motivation to the other business units that if this team could do it, we could make this other team do it too. OMCP: Was the training or certification mandatory or voluntary? Katy: We presented it in a way that essentially felt mandatory, but we did it in a really positive way, sharing, “We want to become an industry-leading organization so we are going, as a collective, to be 100% industry certified.” Once everybody got behind the idea of, “This is what we’re going to do,” those questions haven’t even really come up yet. Therefore I would say it has been a “soft mandatory”. OMCP: Besides the pass rate that you had, what other results have you seen? Katy: I’ve gotten a lot of feedback from our folks that, before going through the process, they were thinking, “Oh, I know this space well. I’m will be able to pass this easily.” But even folks who were more experienced came back and said, “You know what? I still learned quite a bit from the program.” And so what we’re seeing is that now our team can bring even more expertise and knowledge of the ecosystem back to their business units, and perform more efficiently. And so that to me is the ultimate measure of success. OMCP: What’s your advice to someone else just facing the onset of a program? They know they need to upskill their team. They know they need to develop the talent. What are words of wisdom from somebody who’s been through it? Katy: I would show the organization why this is best for them. For the people taking this program and these exams, they need to feel excited and empowered and I really think that’s what helped our organization: They felt like we were doing an amazing thing for them to continue to build their skills–to credential them, to make them even more successful at their jobs. The fact that we are investing in them was a huge win for us. Anything that a leader can do to make the individual employee feel empowered and excited about that, that would be the first step. The second step I would emphasize is the need for leadership support. Having our CIO’s support was phenomenal and helped employees feel energized and empowered about the program. Centrally managing it really helped. I didn’t have to negotiate with managers about funding or time or capacity. They saw it as a gift from central organization that they were getting training, certificates and vouchers. OMCP: Any other advice to consider? Katy: I’ve had experience in the past when budgets are tight or capacity or time is an issue. If somebody has to go through the process of funding it themselves, or doing their own expense reports, it can be an inhibitor. The simple fact of being able to say, “Here’s your training instructions and you can log in and here’s your free voucher for the certification.” It’s easy for participants to take advantage of that. OMCP: Congratulations on a 94% pass rates on the exams – the highest we’ve seen. Well done and we hope other people follow your example. Katy: Thank you. Yes, we are very pleased with it and really appreciate that OMCP has this opportunity for us to take advantage of. Thank you and we will definitely celebrate!